There’s a lot people don’t tell you about getting married, you know, the details of the actual day you say your vows then eat cake. Instead you get a lot of, “You won’t remember anything” and “I busted into tears at the most random time and ruined my lipstick” or my favorite “One of the groomsmen didn’t even show up!” I tend to worry about unexpected details that aren’t planned therefore cannot be controlled, so of course there was some worry buried underneath my immeasurable excitement for our wedding day. Like any rite of passage, everyone from my mom to married girlfriends to the lady checking me out at Target shared little nuggets of wisdom from their own wedding days which made me all the more curious as to what my day would be like. The day after our wedding I laughed as I told my husband how worried I was over the silliest little things, like crying and ruining my make-up or tripping on my dress as I walked down the aisle or somehow the musicians not showing up on time. Of course I worried for no reason. I am convinced there is no better way to spend the morning of your wedding than attending a brunch with your best friends, hosted by women you adore, while all wearing monogrammed oversized Oxfords and yoga pants and reminiscing over your friendships. I was freezing, naturally, and Mom’s hands were shaking because she was “nervous to mess up the little buttons” but it was the sweetest of moments putting on the dress we had picked out together a few months earlier. My matron of honor made sure my shoes were on just right as my bridesmaids and bell ringers looked on with the sweetest smiles. There’s just something about putting on the wedding dress on the day of your wedding that changes you forever. 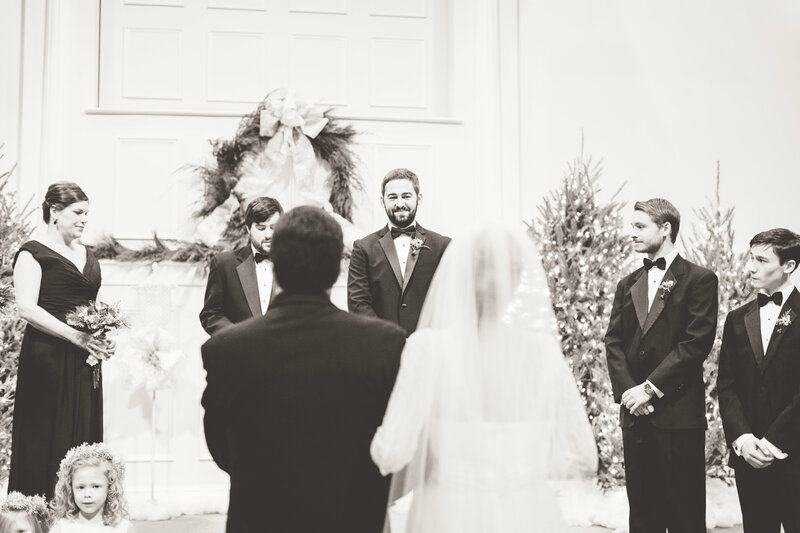 I loved him first, after all, and I will never forget the moment Dad walked in and saw me, veil and all. Mom soon came in to share the moment, too, and I will cherish those moments always. Yes, I cried. I was calm, cool and collected – EXCITED and READY – until everyone was all lined up and I was by myself, waiting a few feet away from them all. I had too much time to think and I could feel the tears welling up in a big way and I did not want to cry my face off while the strings played “The Prayer.” That’s when my matron and maid of honor came to the rescue – they knew I was trying not to lose it, because they just get me – and started mouthing funny memories and “happy thoughts” until I was laughing and the nerves left the building just in time. In lieu of flower girls we had the most precious sisters ring bells announcing my entrance. Sneaking a peak at the candlelit sanctuary and hearing only the ringing of three little bells was the loveliest. I had dreamed of that moment since he proposed five months prior, and when those doors opened I was so worried I would start the ugly cry. I had even warned Dad not to say anything nice before we started walking. The doors opened, I looked up and all I saw was Taylor, looking so handsome in his tux. I wasn’t worried about anything else any longer – this was the moment I had waited for. I didn’t even hear “Ava Maria!” It was definitely an out of body experience; I distinctly remember exactly how I felt during that walk down the aisle and the loving look on my now husband’s face. I still get choked up when I think about it, and I feel so incredibly blessed with two such Godly men in my family. He stole the show, just like we knew he would. The strings started playing this little number and I knew two things for certain: a major kiss was coming and I was officially married to the man of my dreams! This was well worth the extra time spent standing in my four inch heels! It was so nice to see everyone who had come to share our special day and meant so much to hug and quickly catch up. I also have never seen my parents so happy! My genius mom had placed little gold bells at each seat with a poem instructing them to ring the bells as we walked by and we would kiss. Needless to say, Taylor ended up wearing far more red lipstick than he expected. She told Taylor that he was “the most handsomest prince even with his fur face.” Classic. Those were five minutes I’ll never forget. Just he and I, at the back of the reception hall, talking about the ceremony and what an amazing day it had been after so much prayer and hard work. It was perfect. It was such a sweet moment to see the woman who altered my dress into perfection and ran the kitchen for all the amazing food at the reception. She means so much to me and my family so needless to say it was an unexpected emotional moment. This was such a whirlwind – one minute I was eating cake balls and posing for pictures in the reception hall and the next Mom was putting my fur shrug on me and we’re running past friends and family to our car painted and ballooned. I looked back and saw Dad in his Cardinals hat and smiled as we drove away. P.S. For a sneak peak at our official wedding photos taken by the very talented Caley Newberry, go here.